We provide a bespoke supply & Install uPVC Windows & Doors installations & are uPVC Maintenance & Repairs specialists. We have a team of highly skilled professional painters & decorators who have many years’ experience. L.T.D offers everything from interior & exterior painting to wallpapering, coving and plastering. 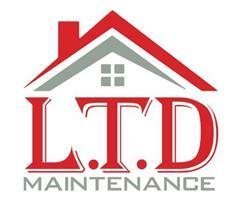 We cover all general building maintenance & repairs with many years’ experience in all fields. Internal & external door hanging & frames, architraves, locks & handles, skirting boards, picture rails, shelves & flat pack furniture building. We supply & install uPVC fascia, soffits, cladding, guttering & repairs. Sealed units, door & window locks, handles, hinges, trims, sealants replaced. We pride ourselves on providing 100% customer satisfaction from the very beginning right through to the completion of all works undertaken, a happy customer is a happy us. All our Double Glazing Installations come with a 10yr insurance backed guarantee (Homepro). As well as Checkatrade we are members of HomePro/Fairtrade’s, City&Guilds. Within the M25, Surrey & surrounding areas.